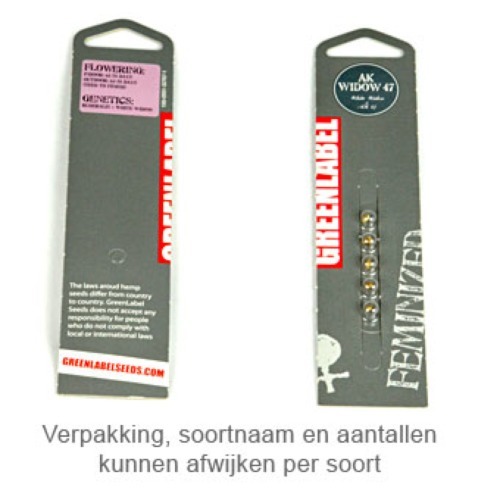 AK Widow 47 from Greenlabel are feminised cannabis seeds of very good and stable quality. This cannabis strain is originated by crossing two well-known coffeeshop classics, namely the AK47 x White Widow and is Sativa dominant. Greenlabel AK Widow 47 is a weedplant which is suitable for an indoor and an outdoor grow. This strain is regularly used as medicinal cannabis, mainly against chronic pain. The effect of this AK Widow 47 is an exciting high, the heavy feeling of the White Widow is a bit gone by the AK genes. Growing cannabis out of these feminised cannabis seeds provide you delicious weed of powerful and good quality. Tell us and our customers what you think of the AK Widow 47 from Greenlabel.